Thank you for visiting the Pars Planitis section of our website. Pars planitis is a potentially blinding illness. It affects children and adults. We recommend that patients with pars planitis (intermediate uveitis), an inflammatory eye disease, establish a relationship with a uveitis specialist and consult with that physician before making any healthcare decisions. The information presented on this website is for educational purposes and is not intended to diagnose health problems or to take the place of professional medical care. In addition to these dedicated web pages, please visit the Pars Planitis Online Support, which is an ongoing project of the Ocular Immunology and Uveitis Foundation and the Uveitis/OID Support Group in Waltham, MA USA. It is clear that Øystein Jakobsen had a stupendous idea when he set up the original pars planitis website in 1998 and made it possible for patients with this rare disease to meet online. Mike Bartolatz joined the effort in 2000 and took on the role of moderator for the discussion group, which he continues today. Without the efforts of these two extraordinary men, none of this would have gotten done. What are the symptoms of pars planitis? How is pars planitis treated? Use this quick load file if the larger version does not load easily for you. Pars planitis is a form of uveitis, one of a diverse group of potentially blinding but treatable inflammatory eye disorders affecting the middle layer of the eye know as the uvea or uveal tract. Pars planitis can occur in one or both eyes. It can affect children as well as adults. In some instances, the disorder occurs as a complication of systemic illness. In other cases, the cause cannot be determined. In either instance, pars planitis is a treatable condition and may require the use of systemic immunosuppression medication and/or surgery to halt its progression. Untreated, 20% of patients with pars planitis will have significant vision loss, and some will become blind. The pars plana is part of the ciliary body. Pars planitis is one form of intermediate uveitis, and some physicians may use this term, “intermediate uveitis,” to describe the condition rather than pars planitis. Click here to print a diagram of the eye (the file is large and may take some time to load). The inflammation is inside the eye, in the middle layer of the eye. This layer is called the uvea. 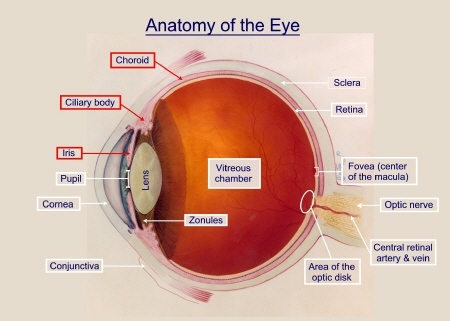 The uvea contains the blood supply for the retina and is made up of three structures: the iris, the ciliary body, and the choriod. The pars plana is part of the ciliary body. The ciliary body is located behind the iris. The ciliary body makes the fluids (aqueous humor) that nourish the lens and cornea and fill the front chamber of the eye. The fluid in the anterior chamber is exchanged about 10 times a day in a healthy eye. The fluid in the middle chamber of the eye (the vitreous chamber) is static; it never exchanges. The ciliary body is divisible into two parts: the pars plana and the pars plicata. Pars planitis is inflammation of the pars plana region. 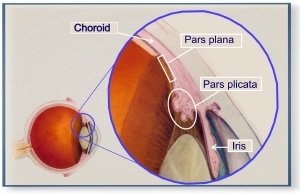 Once the pars plana develops inflammation, white blood cells and other by-products of that inflammation (“inflammatory exudates”) are spilled into the middle chamber of the eye, called the vitreous chamber, where the patient can observe “dots” or “streaks” or “stuff” in their visual field. The medical term for this is “vitritis.” These byproducts of inflammation cloud the fluids in the middle of the eye, making it difficult to see normally. Ophthalmologists can observe these inflammatory exudates when they look into the eye. And, the person with pars planitis can see them as well, or at least “see” their effect on vision. The accumulation of these inflammatory byproducts may be small or extensive. Gravity tends to settle the exudates on the lower part of the retina (the inferior retina) over time (see Figure 2). While the fluids in the anterior chamber (front) of the eye are exchanged frequently, fluids in the vitreous chamber are not; they are static. What you are born with is what you have for life. For this reason, and depending on the amount and type of exudates that get into the vitreous, it can take a long time for vision to improve. In some cases, if the vitreous does not clear, surgery may be considered to remove the clouded vitreous and replace it with a clear fluid. 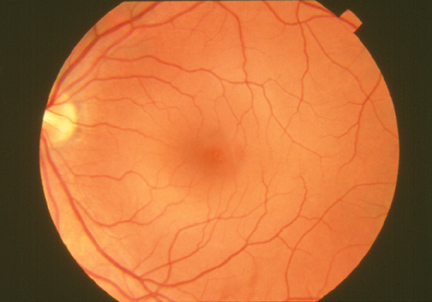 The fluids in the middle (“vitreous”) chamber of a normal eye are clear and allow examination of the back of the eye as seen in this “fundus” photograph of the back of a normal eye. 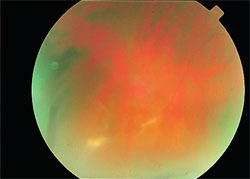 This is the same view, a photograph of the eye of a patient with pars planitis. Inflammatory exudates, white blood cells and other material for the inflamed pars plana, cloud the fluids in the middle of the eye, making it difficult to examine the rear of the eye clearly, and making it difficult for the person looking “out” to see normally as well. Inflammation is a characteristic reaction of tissues to injury or disease. Inflammation can occur anywhere in the body, including inside the eye as in pars planitis. When immune system cells and molecules invade tissues and organs as part of an immune system response, the collection of immune system cells and molecules at a target site is broadly referred to as inflammation. The cause of pars planitis has not been identified, although an immune mediated process has been suggested. The inciting agent, whether endogenous (from within the body) or exogenous (from outside), remains unknown. Histopathologic studies have been performed in only a few cases of pars planitis (PP); a relevant animal model of PP has not been developed. Among all causes of uveitis, the mean age of onset is clearly younger in patients with intermediate uveitis, 30.7 years (+ 15.1 years). The most common causes of intermediate uveitis are idiopathic (69.1%), sarcoidosis (22.2%), multiple sclerosis (MS), and Lyme Disease (0.6%). Multiple sclerosis (MS) has been reported to develop in 7.4% of patients with pars planitis. There are many health conditions associated with the broader category of uveitis. Pars planitis is a treatable condition and may require the use of systemic immunosuppression medication and/or surgery to halt its progression. Chronic steroid use no longer represents the standard of care for this disorder. The need for aggressive treatment of pars planitis has, generally, been under appreciated by the medical community but is now well documented in the medical literature. Patients with pars planitis are urged to seek care from a uveitis specialist or ocular immunologist. Untreated, 20% of patients with pars planitis will have significant vision loss. Once vision loss from pars planitis has occurred it can not be reversed, so early treatment of the disorder, before there is vision loss, is very important. We do not recommend the use of eye drops to treat pars planitis. This is because eye drops can not get to the pars plana; drops have difficulty getting past the lens of the eye. Treatment starts with injections of prednisone into the tissue around the eye. The goal is get prednisone near to that part of the eye that has inflammation. We advocate no more than an absolute maximum of six injections assuming that the patient experiences no complications from using prednisone (high intraocular pressure, glaucoma). These can be given about every 3-4 weeks. If inflammation in the pars plana continues after this treatment, the patient is evaluated for surgery or for immunosuppression therapy, or both. We would recommend that you read the treatment algorithm for pars planitis developed by Dr. Foster at Harvard Medical School. To do so, please click here. Immunosuppression therapy is generally very effective. Surgery, through pars plana vitrectomy and endolaser and cryotherapy has an extremely high cure rate. The goal of treatment is to achieve a durable remission off all steroid and to have a good quality of life. A durable remission means that the eye inflammation does not return when medications are stopped. Quality of life is improved when vision is not lost. This section is designed to help you search the medical literature using the resources of the National Library of Medicine. Use the links below, or create your own searches by going to www.PubMed.gov. Pars planitis is a treatable condition that may require the use of systemic immunosuppression medication and/or surgery to halt it’s progression. Untreated, 20% of patients with pars planitis will have significant vision loss, and some will become blind. The treatment algorithm for pars planitis may be found at this link. A new paradigm for treating autoimmune-mediated ocular inflammation has been pioneered by C. Stephen Foster, M.D. at Harvard Medical School and the Ocular Immunology and Uveitis Foundation. This treatment paradigm is based on a limited tolerance to corticosteroid use and a more proactive approach to corticosteroid-sparing immunomodulatory therapy in an effort to induce a durable remission of ocular inflammatory disease off all corticosteroids. The Pars Planitis Online Support Group is an ongoing project of the Ocular Immunology and Uveitis Foundation and the Uveitis/OID Support Group in Waltham, MA USA. It is clear that Øystein Jakobsen had a stupendous idea when he set up the original pars planitis website in 1998 and made it possible for patients with this rare disease to meet online. Mike Bartolatz joined the effort in 2000 and took on the role of moderator for the discussion group, which he continues today. Without the efforts of these two extraordinary men, none of this would have gotten done. Pars planitis is a potentially blinding illness. It affects children and adults. We recommend that patients with pars planitis (intermediate uveitis), an inflammatory eye disease, establish a relationship with a uveitis specialist and consult with that physician before making any healthcare decisions. The information presented on this website is for educational purposes and is not intended to diagnose health problems or to take the place of professional medical care. Parents and children with pars planitis will also find links to important information through the website and the online Support.